A lot of you know that I have been rather distracted for the last couple of months as my husband has been battling cancer, chemotherapy, radiation, and now surgery and complications from the surgery. After a week of practically living in the hospital, I heard about this community project where we could paint chairs which would then be available for use at community events. Another local artist, Fulgencio Lazo was sponsoring the event. Just plain beige folding chairs — ready to be transformed into works of art. It was only a 2 hour commitment and it was right on my way to the hospital! So I was in. 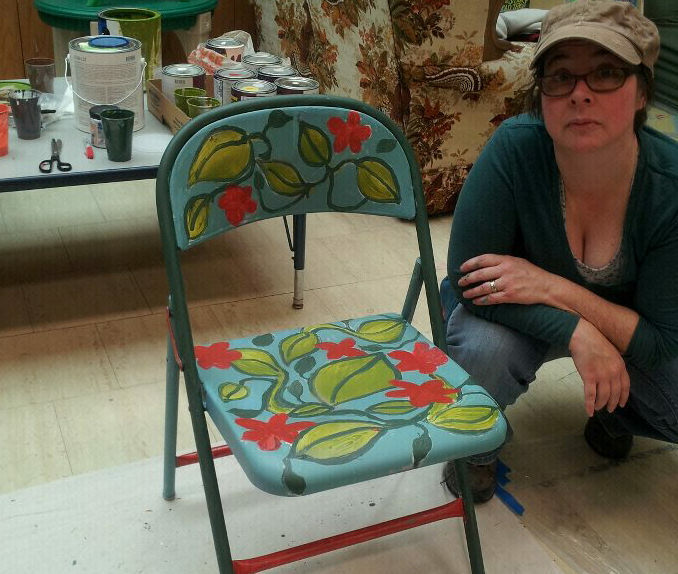 My friend Seanna Jordan came too, and the both of us picked almost the same palette but seriously different designs as we did our art on these chairs. As soon as I can get a photo of the other 20 odd chairs, I will include it because every one of them were delightful. When I arrived there, early for the event, I realized I was absolutely exhausted, I had a headache and what I really wanted to do was just go home and sleep. But once I had a paint brush in my hand, all my travails were forgotten. If art can be therapy, it was that for me for certain that day. 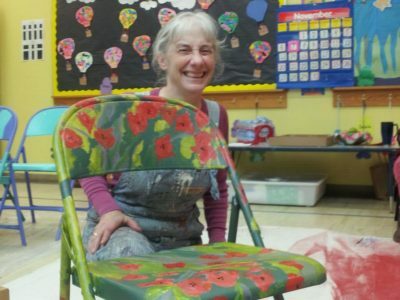 As the other artists staidly painted, sitting on little chairs or carefully bending over their work, I was sprawled upon the floor reaching every angle of my chair and loving it immensely. If you ever get to sit on my chair, let me know! all of the paint was house paint, interior/exterior latex! How are you? Just stopped by looking for more chairs… Hope your days are filled with peace. What a wonderful project and I love both your results. Just checkin to see if you posted more chairs. Hope you day is good. hello, a few of the chairs have not been turned in yet. when they get them all done, there will be a photo. I will definitely post it here and let you know. what a wonderful project! your chairs turned out so well! i’m sending your hubby healing thoughts and prayers. thanks for sharing! Fabulous project and your chair is awesome, as in your friend’s. Funny how painting can take away travails. It helped alleviate a headache for me too this week. sounds like we’re on to something here!! I think it is great you were able to take a few minutes for you. The chair is amazing- what a great idea for the community. Sending prayers for you and your family. P.s. Thanks for the blog visit. So beautiful and touching! I love the paintings you both have done. These are lovely chairs and would surely give hope to anyone. I pray that your husband will recover quickly and God be on his side. Take care! What a wonderful service project! This is such a great project. I am so glad you found some theraputic distraction from all your worries for your husband. Hope he is better soon. I am sorry to hear about your husband. My best wishes to you both. Yes, art is good theraphy and the chairs are fabulous. I’d love a chair like this. I told my husband that when we get our next house, we are going to only buy 2nd hand furniture – so that I can paint them :). Haha, it might be a very colourful house full of furniture that don’t go together! Thanks for dropping by my blogpost. I think what might have happened is that your internet browser was taking its time loading the images… No worries if you don’t see them this time; I know there is lots on your mind. Take care. Love this it is such a wonderful project. Hope you do post more of the other works..Enjoyed my visit to your blog. Angela, unfortunately there are no good shots of all the chairs. Hopefully someone will take a photo soon and yes, I will post it. This is WONDERFUL! How great that you could lift your spirit and make a beautiful piece of art — as therapy as well as expression of beauty! Being able to share your talent while uplifting your own spirit is so inspirational. Your chair is a work of art. I look forward to seeing all the chairs. I am grateful that art therapy helped you and may the angels watch over your husband. Blessed be. Isn’t it reassuring that art can lift you up and give you comfort even while in the midst of stress and sadness. I’ve been shown this too and it’s good to know it’s there for the asking. Your chair is more than just physical support! Good work. What a wonderful project, and gorgeous chair, my dear! I am praying for Donald still. Mimi, I absolutely love your chair!! What a fantastic way to share your talent with the community!! aw, thanks. I needed that.